Advantages: Superbly printed, thin carrier film, perfect registration of colours, variety of schemes. Conclusion: A well executed decal sheet containing a varied selection of subjects. 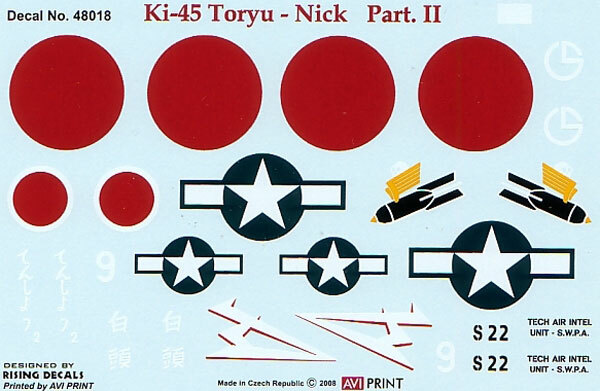 Not too long ago Hasegawa excited Japanese aircraft fans with the welcome release of their 1:48 scale Ki-45 series. Avi Print has taken advantage of this by releasing a set of aftermarket decals and this is their second sheet for the “Dragon-Slayer”. There are 4 aircraft represented, each with a distinctive scheme that varies in complexity. This will allow the modeler to choose one that lies within their painting capabilities. Ki-45 Kai Hei - 5th Sentai, Negros, Philippines, August 1944. Finish quoted as overall grey/green with dark green camouflage pattern. Ki-45 Kai Hei - 5th Sentai, Kiyoshu AB, Aichi Prefecture, June 1945. Finish quoted as overall green with natural metal upper fuselage. 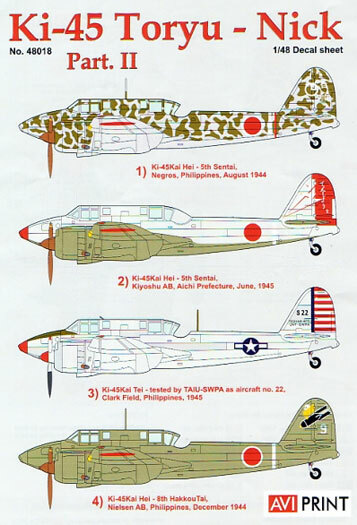 Ki-45 Kai Tei – tested by TAIU-SWPA as aircraft No. 22, Clark Field, Philippines, 1945. Finish quoted as overall natural metal…note that two Ho-5 20mm cannons and a nonstandard antenna are fitted. Ki-45 Kai Hei – 8th Hakkou Tai, Nielsen AB, Philippines, December 1944. Finish quoted as overall green. The decals are superbly printed with very thin carrier film and perfect registration. A nice touch would have been the inclusion of some basic stencil data but it seems modelers can’t have everything. Avi Print is probably better known for the decals they make for others. Many established kit manufacturers use their products such as Eduard, MPM, CMK and Gavia. This is not surprising as the quality is first class.If you want a “Toryu” scheme that is a bit different from the rest, then this sheet could be what you’re looking for.